Avenue 31, a new sibling of the chic Monaco restaurant of the same name, is set to open in Summer 2015 in the former Le Clafoutis space. Expect a Mediterranean menu and a bar program from mixologist extraordinaire Matthew “Eat Your Drink” Biancaniello, which will include a selection of creative, boozy oysters. Avenue 31, 8630 Sunset Blvd., West Hollywood, CA 90069, no phone. The folks behind Peruvian favorite Los Balcones in Hollywood have opened a plant-based, vegan restaurant next door, Chavela Comida y Sangria, which is also the name of a famous Peruvian-style sangria. Chef Rachel Carr (Cru) offers vegan, organic Latin-inspired dishes including barbacoa portobello tacos, beet tartare with cashew ricotta, quinoa and fresh corn polenta, and a wild mushroom mole verde enchilada. To drink, find a variety of chavelas and cocktails from mixologist Joel Black; dessert includes chili chocolate ganache made with avocado. Dinner nightly. Chavela Comida y Sangria, 1358 Vine St., Hollywood, CA 90028, 323-871-8099. In the former Raphael space in Studio City, Cocina Condesa is now a colorful mezcalaria with upscale Mexican street food. The menu includes tacos ranging from al pastor, asada and carnitas to fresh cactus and mushroom; antojitos like red snapper ceviche and shrimp agua chile; and mains featuring chocolate mole chicken enchiladas and corn masa crepas. Specialty Latin-inspired cocktails lean toward mezcal. Cocina Condesa, 11616 Ventura Blvd., Studio City, CA 91604, 818-579-4264. 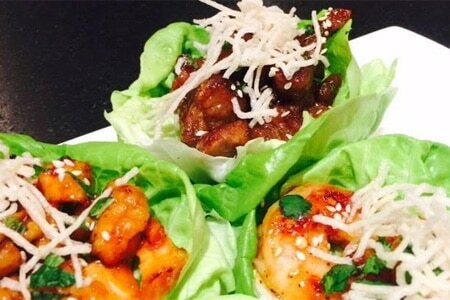 House of Macau in Hollywood features modern takes on classic Macanese cuisine. House of Macau, 1600 Vine St., Los Angeles, CA 90028, 323-745-5038. Chef Ted Hopson and beverage director Ann-Marie Verdi, who worked together at Father’s Office, have partnered on The Bellwether, a seasonal, family-style restaurant in Studio City. The beverage program showcases craft beer, wines from independent California vineyards and cocktails that center on market-driven house infusions, with options from each category flowing from 20 taps. Ana Henton designed the space, which encompasses 3,200 square feet, including 70 indoor seats at crimson leather banquettes and butcher block tables, a full bar and 30 patio seats. The Bellwether, 13251 Ventura Blvd., Studio City, CA 91604, 818-285-8184. Broken Spanish, a project from chef Ray Garcia (B.S. Taqueria), is open for dinner nightly starting at 5:30 p.m. The restaurant is located in the former Rivera space in downtown Los Angeles. Broken Spanish, Met Lofts, 1050 S. Flower St., Los Angeles, CA 90015, 213-749-1460. The Point is a new shopping, dining and entertainment destination in El Segundo. It will feature several restaurants including Superba Food + Bread and Craft Shack (a concept from Simms Restaurant Group). True Food Kitchen, North Italia, Hopdoddy Burger Bar and ShopHouse Southeast Asian Kitchen have already opened. For more information, visit The Point's official website. The Point, 850 S. Sepulveda Blvd., El Segundo, CA 90245, 310-414-5280. Chef Brandon Boudet and partner Warner Ebbink (Dominick’s, Little Dom’s) have opened a cool, neighborhood bar, MiniBar, adjacent to the 101 Coffee Shop in the Best Western Hotel in Hollywood. The intimate room features high bar stools and gold-dipped tables, giving the space a '70s feel (to match the tunes). The menu offers eight simply crafted cocktails ranging from a Harvey Wallbanger to a Rusty Nail perked up with an absinthe rinse and fresh rosemary. Also, find local craft beers and a tiny, boutique wine list. MiniBar, Best Western Hotel, 6141 Franklin Ave., Hollywood, CA 90028, 323-798-4939. Matthew Kenney’s Plant Food and Wine offers a selection of locally sourced, plant-based fare, accompanied by an extensive wine list of organic and biodynamic varietals. The 65-seat restaurant includes an open-air courtyard, fireplace and a wine room. Plant Food and Wine, 1009 Abbot Kinney Blvd., Venice, CA 90291, 310-450-1009. In Hancock Park, the former Girasole has reopened as Vernetti. Chef Steve Vernetti dishes up Italian-American classics such as house-made pastas including rigatoni and papperdelle. Other dishes include fried polenta with yam and sage, whole-roasted branzino and passionfruit cheesecake. 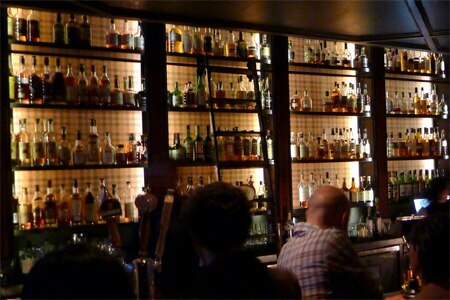 Vernetti, 225 N. Larchmont Blvd., Los Angeles, CA 90004, 323-798-5886. Chef David LeFevre and the Simms Restaurant Group (Simmzy's, Tin Roof Bistro) are behind The Arthur J in the former Circa space in Manhattan Beach. This is their third collaboration, following MB Post and Fishing With Dynamite. 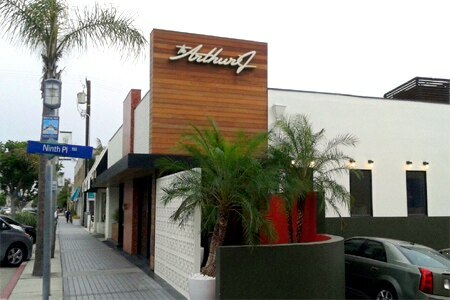 The Arthur J, 903 Manhattan Ave., Manhattan Beach, CA 90266, 310-878-9620. The Ritz-Carlton, Los Angeles celebrates summer with the opening of the rooftop patio to both hotel residents and the public for the first time in the hotel’s five-year history. WP24 Rooftop Patio is located on the 26th-floor rooftop terrace, which features panoramic views of Los Angeles. A summertime grilling series is offered every Friday and Saturday through September 5. Guests with a pre-confirmed reservation may enjoy a selection of Asian-inspired, a la carte small bites, and seasonal cocktails. The pool is closed for swimming during these evenings, as guests soak up live jazz high above the bustling city below. Reservations must be made through WP24 Restaurant. WP24 Rooftop Patio, The Ritz-Carlton, Los Angeles, L.A. Live, 900 W. Olympic Blvd., 24th Floor, Los Angeles, CA 90015, 213-743-8824. The Museum of the American Cocktail (MOTAC) Whisk(e)y Gallery has opened in Seven Grand. This is the first permanent Los Angeles exhibit for the Museum of the American Cocktail, which is part of the SoFAB Institute based in New Orleans. For more information visit the the SoFAB Institute web site. Seven Grand, 515 W. 7th St., 2nd floor, Los Angeles, CA 90017, 213-614-0737.
dineLA Restaurant Week returns July 13-26, 2015. This event offers diners the opportunity to indulge in specially priced menus from a variety of Los Angeles area restaurants. Downtown bar The Edison will open a sister location in Orlando at Disney Springs, the re-imagined Downtown Disney area at Walt Disney World. The opening for The Edison is scheduled for 2016. The Edison, Higgins Building, 108 W. Second St., Los Angeles, CA 90012, 213-613-0000. During the month of June, Providence celebrates its 10th anniversary, and will feature “value-driven” four-course tasting menus ($80 per person, or $125 with wine tastings) as a tribute to the pricing when Providence first opened its doors in 2005. While the menus are updated nightly, seasonal courses may include scallop with English peas, cherry blossom and buckwheat or wild King salmon with favas, almond and morels. Providence, 5955 Melrose Ave., Los Angeles, CA 90038, 323-460-4170. Beverly Boulevard’s European-inspired food hall, Stir Market, has launched a new kids' menu, featuring food and drink selections crafted by recently appointed executive chef Stacy Rampton and Food Network personality and chef/partner Jet Tila, for guests 12 and under. Junior gourmands can enjoy the likes of “Meyer lemon pancakes jr.” with whipped crème fraiche and candied zest (weekend brunch only); “after-school cinnamon toast” with caramelized apple butter and brioche ($5.95); and cheesy flatbread with burrata and Parmesan ($7.95). Chef Tila’s two-year-old daughter’s favorite dish is the “Stir Market yummy bowl” with roast chicken and soy Teriyaki sauce ($8.95). 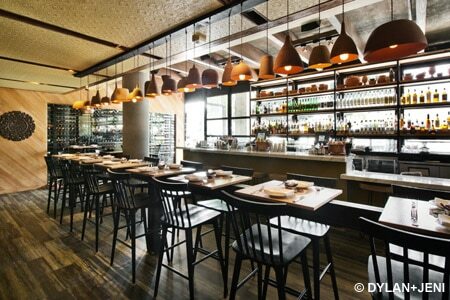 Stir Market, 7475 Beverly Blvd., Los Angeles, CA 90036, 323-879-8283. Four Seasons Hotel Westlake Village is planning to open a new American steakhouse-type restaurant in the space currently occupied by the Lobby Lounge. Significant remodeling will be involved. Stay tuned for more details. Lobby Lounge, Four Seasons Hotel Westlake Village, Two Dole Dr., Westlake Village, CA 91362, 818-575-3100. Chef Chad Colby, the opening chef at chi SPACCA, has departed his post to open a restaurant in Hollywood with chef Curtis Stone (Maude). Zach Allen, a longtime Mario Batali disciple, replaces Colby as chi SPACCA executive chef. Allen has worked for Batali, Joe Bastianich and New York-based B&B Hospitality Group since 1999. He installed a salumi program at Otto Enoteca Pizzeria in New York and assumes control of the similarly vaunted meat locker at chi SPACCA, which B&B owns with chef Nancy Silverton. chi SPACCA, 6610 Melrose Ave., Los Angeles, CA 90038, 323-297-1133. Chef Evan Funke has left Bucato Restaurant in Culver City. Taking over the kitchen is executive sous chef Colin Akiyama. Bucato Restaurant, Helms Bakery, 3280 Helms Ave., Culver City, CA 90034, 310-876-0286. The Pasadena location of restaurateur Steven Arroyo's Escuela Taqueria has closed. The branch on Beverly Boulevard remains open. Escuela Taqueria, One Colorado, 16 Miller Alley, Pasadena, CA 91103, no phone. The Capital Grille in West Hollywood has shuttered. The Costa Mesa location of the steakhouse chain remains open. The Capital Grille, 8614 Beverly Blvd., West Hollywood, CA 90048, no phone. Nick & Stef’s Steakhouse downtown is temporarily closed. It is scheduled to re-open in October 2015 with a new look. Nick & Stef’s Steakhouse, 330 S. Hope St., Los Angeles, CA 90071, 213-680-0330.